Disney Pixar’s new cg based feature, Brave is a classic coming-of-age story for the twenty-first century. This princess tory (yes, despite what Disney execs said about Tangled, this is another princess movie) isn’t just another princess story, though. Rather, it’s both a coming-of-age story and a story that incorporates an element that has been standard to Disney features for ages. That element is the element of family. There is no denying the movie’s similarity to a certain much older story with a similar plot. But that similarity is loose at best. This movie took the former movie’s plot and altered it for a movie that the entire family will enjoy. And now that it has been released to DVD, Blu-ray and Blu-ray/DVD combo pack, families will get even more enjoyment and appreciation for this twenty first century princess movie. When Disney stated in 2011 that its CG based feature, Tangled would be the last of its princess movies for the foreseeable future, that statement was obviously met with quite a bit of resentment from audiences. So rather than fight its audiences, Disney (along with Pixar) gave audiences what they wanted. The final product is Brave. Brave is at its most basic level, a princess movie. But it’s not Disney’s standard princess movie. There’s no romance subplot holding the story down. Rather, it’s a new classic coming-of-age story for young viewers everywhere. The whole story focuses on young princess Merida, who is very much the stereotypical Tomboy. Yes she’s feminine. And she’s also very headstrong and not like the other girls out there. This is something to which so many female audiences can relate even now in the new era of movies. She rides horses and shots arrows. But she still has a certain level of femininity in that she is the classic daddy’s girl. It is her inability to balance the two that leads to her conflicting relationship with her mother and eventually her self-realization and coming-of-age. That coming-of-age and self-realization make for a story that the entire family will enjoy and appreciate just as much with every watch. Anyone who has already seen Brave in theaters understands how entertaining this new movie is for the whole family. Now that it has been released on multiple home formats, that enjoyment is increased thanks to the abundance of bonus features on the first pair of discs in the Ultimate Collector’s Edition of the movie. Audiences see that not only do Disney and Pixar stick to Walt Disney’s emphasis on family in Brave, but it also sticks to the tradition of maintaining the story’s believability. The bonus features included in the first disc of the set take viewers behind the scenes of the movie’s creation. Audiences will discover that yet again, rather than just make up some fantastical world, the people behind the story went into full depth to make it as believable a story as possible. They even went as far as to go to Scotland and take in the region, drawing regions that they toured so as to best present the world of Brave. This is nothing new for Disney or Pixar. And that this tradition of sustaining belief for audiences makes the movie that much more worthy of respect. Along with going to Scotland to document it firsthand, the crew behind the movie also got a first hand sword fighting demonstration so as to best present believable action on screen. There is also a point in which the crew discusses details as minute as making the tapestry which Merida rips with her sword look as real as possible. Yet again, audiences see the dedication to believability by those involved in the creation of this movie. These are just some of the bonus features that make this new home release of Brave that much more enjoyment and worth a second watch. There are even more features that audiences will enjoy as they go through each one. Audiences will see just how much dedication went into making this movie the best that it could be for everyone to see. 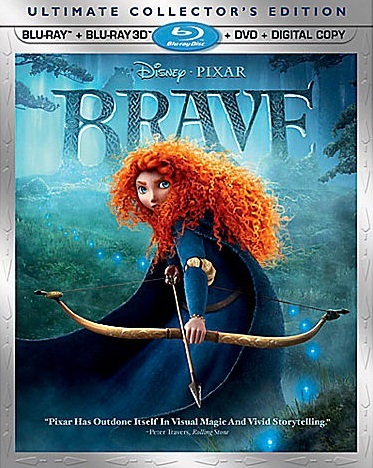 The special features are just one part of what makes this brand new Ultimate Collector’s Edition of Brave enjoyable and a welcome gift under the tree this holiday season. This five disc set includes not only the movie in Blu-ray format complete with bonus features, but also in standard def DVD format and 3D Blu-ray format. There is even an extra digital disc that will allow users with mobile devices such as tablets to watch the movie anywhere they go without having to actually take the movie with them. Or for those without tablets, the DVD option allows viewers with in vehicle DVD monitors and players to play the DVD for kids on those long family trips. That’s especially helpful now in the holiday season as families are making their annual pilgrimages to see family. And even when families get to their destinations, it can still be viewed on any of the formats included in this set. So while it may be the most expensive of the presentations, it also presents the most value for families. The overall value of the Ultimate Collector’s Edition of Brave alone makes this a set worth checking out for any fan of the movie. Add in solid writing and bonus features that make for even more appreciation and enjoyment of the story, and audiences get a set that really is the Ultimate Collector’s Set for this new modern classic princess flick from Disney and Pixar. Brave is available in stores and online now. It can be ordered online direct via the Disney store at http://www.disneystore.com/brave-5-disc-set-ultimate-collectors-edition/mp/1323109/1000316/. This is one of the key moments of dialogue between Katie (Kelly MacDonald–Disney’s “Brave”) and James (David Tennant–Doctor Who) in IFC Film’s recent rom/com take off of Cinderella, “The Decoy Bride.” That single line of dialogue is so important because not only does it take off Cinderella, it also lifts at least somewhat from Bette Midler’s 1997 rom/com, “That Old Feeling.” It also lifts, at least to a certain degree, from the 1990 Julia Roberts/Richard Gere rom/com “Pretty Woman.” It’s pretty easy to see Macdonald attempting to emulate Julia Roberts throughout the movie. “Decoy Bride” does lift from other rom/com classics, as noted. But in its defense, the central plot of James and Lara trying to escape the papparazzi so that they can get married is a prime example of art imitating life, especially withthe recent case surrounding certain celebrities, who will remain unnamed here. That it’s such a direct mirror of the world’s obsession with celebrities makes it worthy of its share of laughs. The story behind “The Decoy Bride” is great fun. Audiences who want a little more insight into the story will appreciate the cast interviews included in the special features. Each cast member discusses being added to the film, and working together. [David] Tennant even discusses the weather during filming. While a rain machine was used at some points, Tennant points out how precise the people on the Isle of Man were in predicting the weather. Director Sheree Folkson advances that with her own discussionon how perfectly the weather played out for the entire movie. The Decoy Bride is in essence an update of the classic story of Cinderella. And it does lift from other previous rom/coms. But it still manages to make its own identity and life. And keeping that in mind, it is worth at least one watch by any fan of the rom/com genre. To keep up with the latest entertainment reviews and news, go to http://www.facebook.com/philspicks and “Like” it or its companion page at http://www.facebook.com/pages/Reel-Reviews/381028148587141. fans can also keep up with the laest entertainment reviews and news at https://philspicks.wordpress.com.